“Place” is associated with just about everything that our senses come across. In whatever activity our body and mind take part in, we do so in a “place”; whether or not one recognizes or appreciates such a phenomenon is an entire dialogue on its own. Our daily commute takes place somewhere (train, subway, bus, parking lot-like I-66); our work takes place somewhere (cubicle, hole-in-the-wall, highrise); our mingling chatter takes place somewhere (sidewalk, bar, lunch line at the salad place that for some reason always has a line); our gastronomic activities take place somewhere (Korean deli, at my desk in front of a computer monitor, Indian lunch buffets with unnamed but delicious curry creations). Coffee epitomizes the imprinting power of place. In turn, place symbolizes an attached ambiance, a feel, a mood, a hue associated with the place that holds the coffee. A vast number of coffee drinkers, for decades, drank coffee not only for the sake of coffee, but more so for the attached ambiance. The price one paid for a cup of black liquid gold was not limited to the beans themselves, but included the chair one sat in, the light fixtures above one’s head, and the streaming music. I recall, as a youngster in Korea, a time when (before the onslaught of Starbucks and other chains) coffee shops were referred to as “dabang.” These peculiar establishments – now almost unheard of, practically extinct – were the preferred meet-and-greet points for just about any occasion, particularly for blind dates. The servers slash waitresses, affectionately referred to as “madame,” played the roll of hostess more than a mere server. Patrons oft returned to a said dabang just for a renowned madame’s company. And the coffee. Dabang establishments have left a permanent imprint on Korea’s coffee culture, a tattoo-like presence. The term “dabang coffee” is still used when one would like to sip a cup with cream and sugar, with more cream and sugar. Coffee was first introduced in Korea to the royal family at the start of the twentieth century, and as the beverage began to take to the masses, the unfamiliar and rather bitter taste of this black liquid was understandably pacified by the inclusion of cream and sugar. Like other cultures, coffee was enjoyed as an after-meal splurge, a sugary exclamation point, acting more as a dessert than anything else. 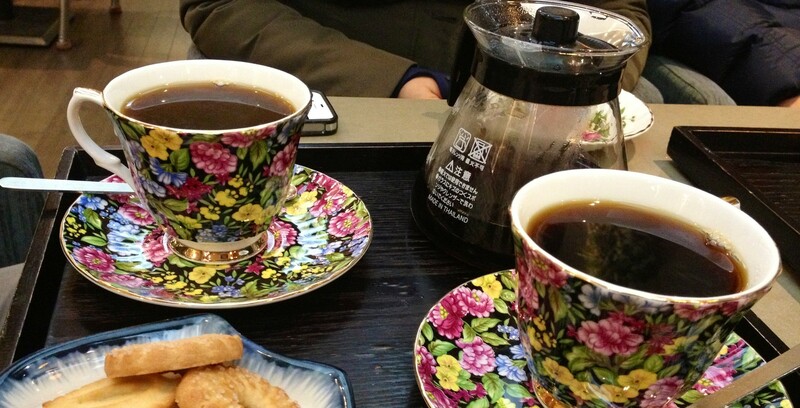 The popularity of “Americanos” and black drip coffee is only recent history on the Peninsula. The lasting impact of said dabangs can still be reminisced by Korea’s love for instant coffee; convenient one-pack-a-cup sticks with ground coffee, powdered cream, and sugar. Coffee influences where and how we converse with one another. Where once a dabang hosted blind dates, a Starbucks or Coffee Bean stands to host chitchatting college students in Gangnam. A lasting similarity, though, is the relatively muted interest towards the coffee itself; as it was decades ago, one pays for one’s seat and right to chat in that specific ambiance. “I took a seat in a kafeneion. The coffee and water came. Today is Sunday, services are over, and now the householders proceed to the square. Dressed in their Sunday best, grim and pompous. They sit down, light their cigarettes, sip water and wait with faces turned toward the north. What are they waiting for? The newspapers from Athens. React to the order around you, resist the current, say no! when all those around you are murmuring yes; this is one of the most demanding obligations of a soul that lives in a bankrupt era. Consonance and balance are fertile virtues in creative times; but when the historical moment of dissolution is at hand, a great struggle is needed to keep your soul in order. In order to catch hold, not to be swept away, a good method is to concentrate your mind on a great soul, one which sprang up and blossomed in your native soil. Today as I sit in the Tripolitan coffeehouses watching the people and listening to their talk, I sense that if I were a young man living in Tripolis, I would concentrate – in order to save myself – upon the rich, aggressive, cunning and valiant soul of Kolokotronis.” (Nikos Kazantzakis, Journey to the Morea). Throughout his account of his travels through Greece, Kazantzakis was intrigued by the the substance of people’s conversations while they sipped coffee. Not even “sipped,” but often his subjects would order a coffee, a couple glasses of water, and converse; the sipping of coffee is rarely mentioned in his narrative. The Greeks of the Peloponnesos, awaiting news from Athens, debated politics and the economy; they spoke of struggle, of resistance, of bleak hope. Coffee was the perfect vehicle to deliver such conversations. In the midst of political chaos and uncertainty, the “kafeneion” served as the vehicle of mutual gatherings – whether or not the coffee was consumed was secondary. And the Greeks seemed fond of their glass of cold water with their coffee; reason not elaborated by the author, but indeed for some purpose. Coffee, water and cigarettes, inseparable trio for conversation, at least for the Greeks. The cold-brewed coffee transforms one’s perception of the standard morning buzz or after meal coffee; the art of “culinary coffee” should be increasingly appreciated. La Colombe Torrefaction, a personal favorite, steeps its dark Corsica blend for sixteen hours in stainless steel wine tanks, resulting in its Pure Black creation with an ultimate clean and crisp coffee. Its subtle cocoa tones rest profoundly on one’s tongue – throughout the meal, and specifically with red meat. Coffee and meat, lamb chops or a bone-in rib eye for instance, are excellent partners in crime. 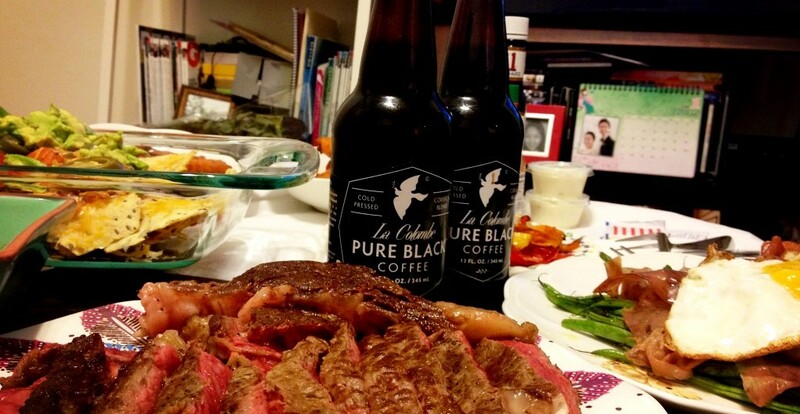 The natural sweetness in cold-brew coffee sublimely tosses around the iron and fat in a bloody steak. A few swings of the steak knife and a chug of coffee transports one’s senses to Brazil, Colombia, Mexico, wherever the coffee beans have been grown and hand-picked. 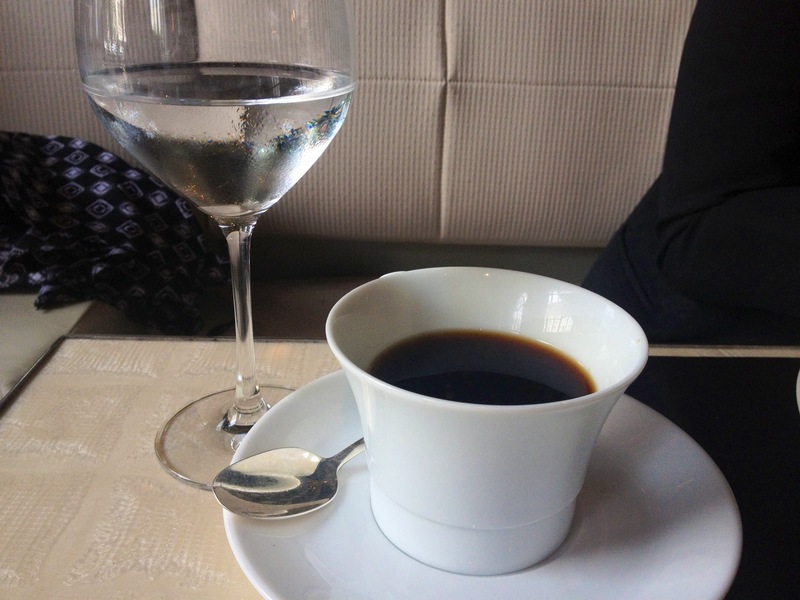 Culinary coffee allows a profound shift in the “place” of coffee. No longer limited to the dabang, the Starbucks, or kafeneion, coffee now roams freely from table to table, across cuisines, to be enjoyed in conjunction with a culture’s specialty dish or mom’s home cooking. Coffee’s notes and flavors are vast and numerous like the Greek gods, each with a variant fury. Matching a bottle of some French wine with a Chilean sea bass (which is, by the way, endangered) drenched in truffle oil should now be as ancient and antiquated like the ruins of Corinth. Culinary matching now breathes in the fresh wisp of fresh-ground coffee or a “cold one” from steel wine tanks. The vast bean varieties from growing regions all across the globe presents an unexplored “black ocean” within the art of food. Some say we are what we eat. One must add that we are what we drink, where we drink, and to what purpose we drink to. Coffee signifies place. Valuation shall not be shortchanged only by the beans’ price tag, or with the real estate associated with the chair one sits in to enjoy such coffee. True valuation, like good coffee, shifts – from table to counter top to cafes and the streets. Where we drink will always add value. With whom we drink always adds conversation, with its own scale of values. What we drink (region, bean, roast, brewing method) levitates our coffee experience beyond our physical presence and transports coffee’s sense of place to unseen and unknown plateaus. In all aspects, coffee is the medium in which one finds common ground where none previously existed, orating stories of people and their places, echoing those efforts of Homer himself. Great blog well written as I need at least 2 espresso’s to kick start my day!..this was a great read whilst i enjoyed them and got my head into gear.. I remind myself to not open my mouth before coffee. Thanks for visiting! Here is an awesome post from the blog called I Am Not A Lawyer about that wonderful addictive thing called COFFEE! Enjoy on Cooking Up a Storm With Miss Polly. Thank you for the reblog! Your site is beautiful. You are welcome and thank you so much for your positive comments! You make me happy I work so much on it. I would love you to fill out a questionnaire on my member based cooking site called “Cooking Up a Storm All Over The World!” That is the first blog I created over two years ago. If you fill in gibberish it won’t work. I wanted to create a place where people all over the world could meet each other and learn from each other’s cultures and cuisines. You just gave me an idea to create something. If you should ever want to be a Contributing Writer on the site, just let me know! your self? Anyway keep up the nice high quality writing, it is rae too see a nice weblog like this one nowadays..
Portanto, analise e veja se essa opção é a melhor para ajudar você emagrecer de vez. compatibles avec votre objectif de perte de poids. l’Éducation sera remplacé lors d’un remaniement ministériel, probablement en juin. Muy motivante tu redacción y hay cuantiosas información que no sabía que me has aclarado, esta maravilloso..